Castle Knott is not one of the best known fells in the Dales but together with Middleton Fell forms the formidable western slopes of Barbondale. Castle Knott forms, along with its higher northern neighbour Middleton Fell, a substantial tract of fellside that lies on the western fringes of the Yorkshire Dales National Park. Historically this area was part of Westmorland but now belongs to Cumbria. 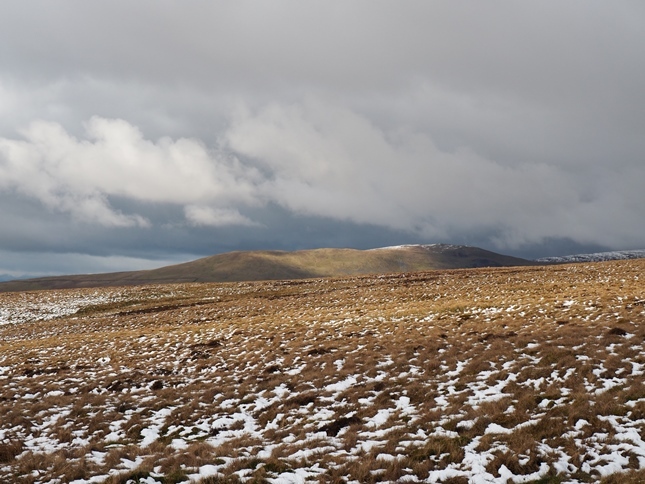 Whilst the eastern and northern flanks of Middleton Fell were included in the Yorkshire Dales National Park the whole of Castle Knott was originally excluded until that is the extension to the national park in August 2016. To the west of Castle Knott is Lunesdale, to the north Middleton Fell and its summit Calf Top, while to the south and east the boundary of the fell is formed by the steep drop into Barbondale. 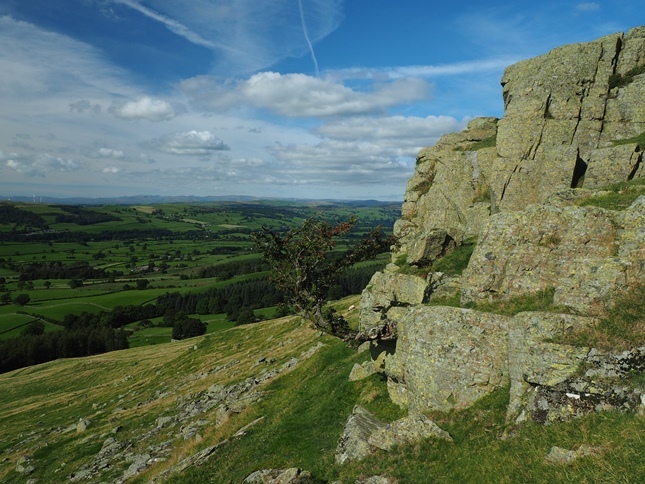 The steep eastern flanks of both Castle Knott and Middleton Fell were caused by the Dent Fault which runs from Kirkby Stephen to Kirkby Lonsdale, a distance of 32km. 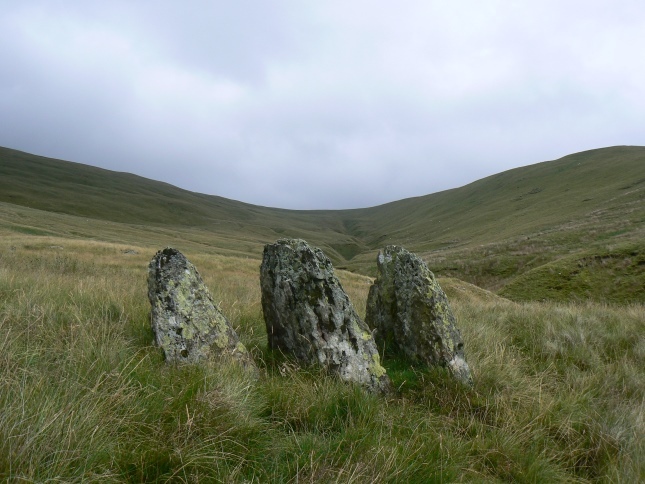 The Dent Fault is one of the best known examples in the country of a reverse fault and forms a division between the limestone country of the Yorkshire Dales and the Silurian rock and shales that form the basis of both the Howgill Fells as well as Middleton Fell and Castle Knott. 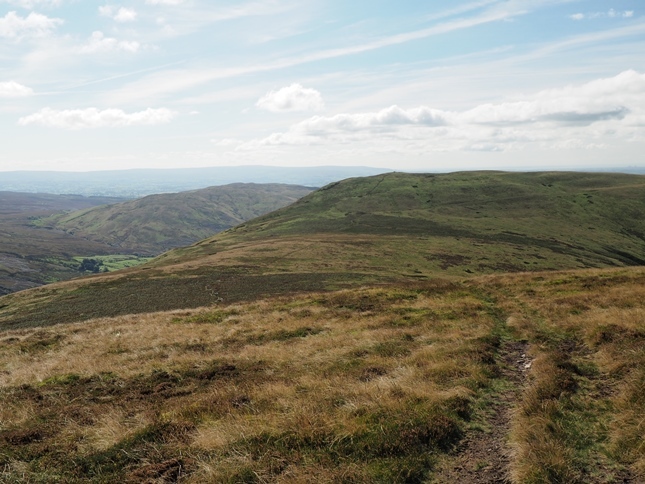 The western flanks of the fell are not quite as steep as the Barbondale flanks but it is on this side that the underlying Silurian rock is most exposed particularly in the area below Eskholme Pike including the modest but attractive Devil’s Crag. The summit of Castle Knott is marked by a fairly large cairn close to the steep drop into Barbondale. The views are excellent particularly down into Barbondale and across to Great Coum and Gragareth. 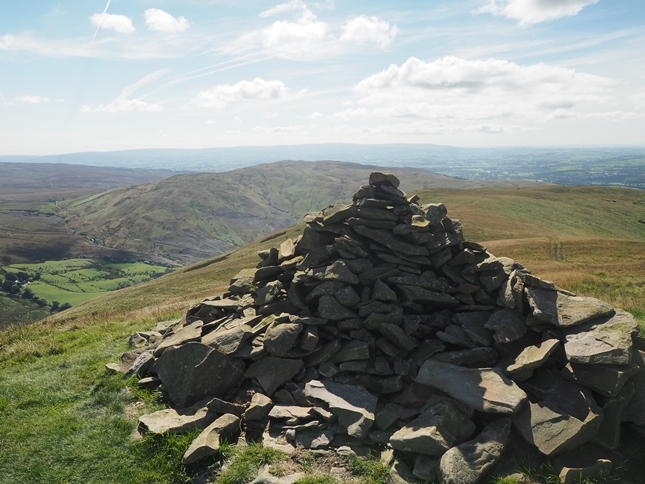 Another fine viewpoint is from the fine cairn that sits on Eskholme Pike near the abrupt terminus of the fell to the south west. It is possibly the best viewpoint I have come across for the Lune Valley which can be seen stretching from the Lune Gorge to the north all the way to fringes of Bowland to the south. 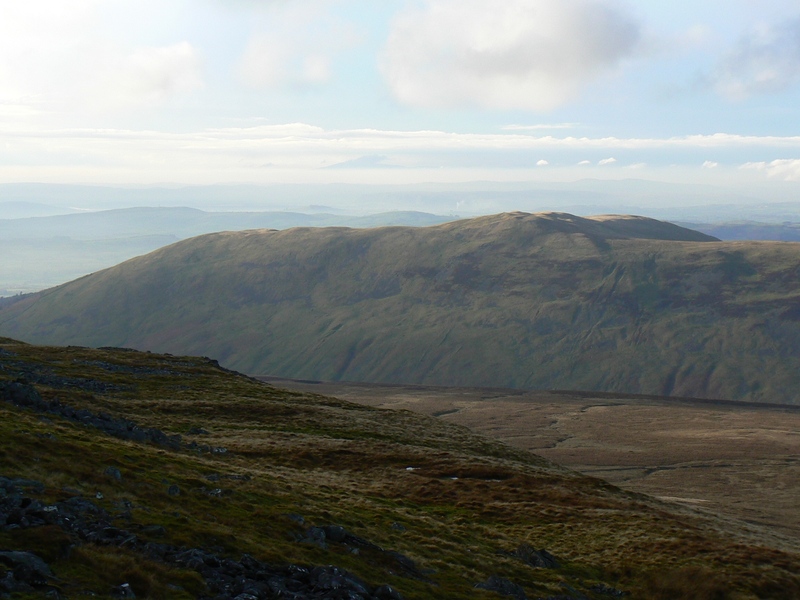 Castle Knott is one of the less fashionable fells in the Yorkshire Dales. 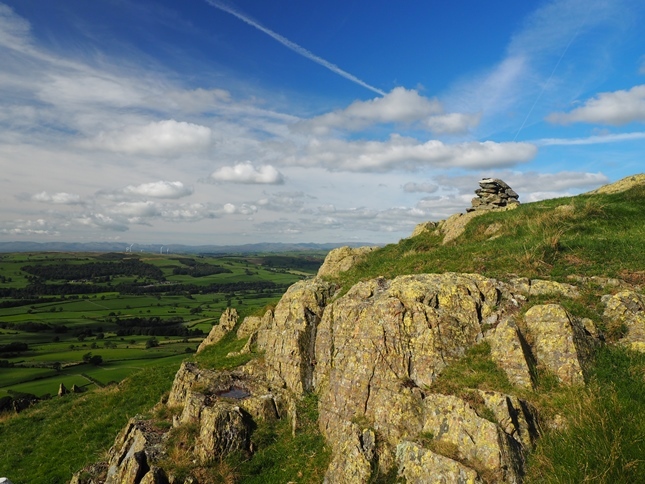 If it is climbed it is usually in tandem with Calf Top, a fell which probably has seen an upsurge in its own popularity thanks to it having recently being classed as an English mountain. 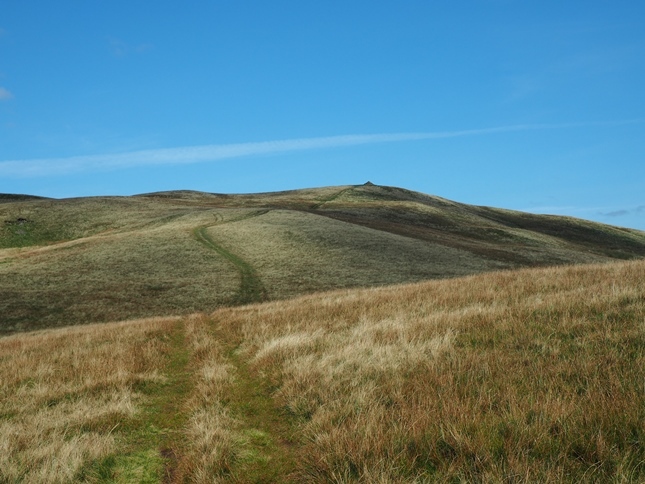 The quickest way to the top is from Barbon following the path to the summit via Eskholme Pike. 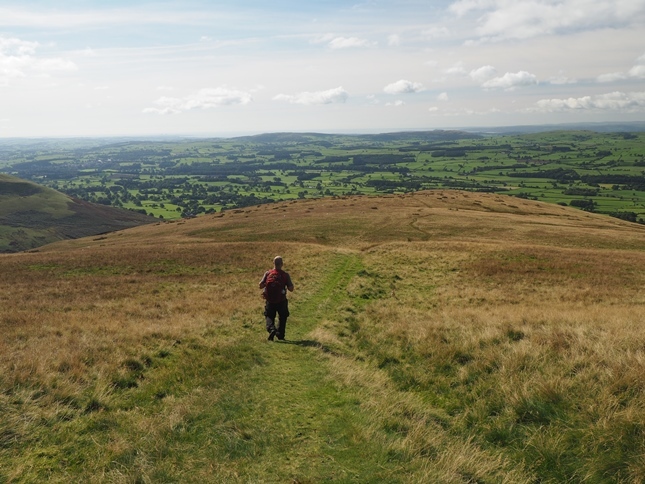 On all three of my visits to date I’ve climbed Calf Top first and used the Barbon path as my route of descent so I can enjoy the lovely views of Lunesdale.